1. Prepare Chili Dipping Sauce: In medium bowl, whisk together all ingredients except nut topping. Cover with plastic wrap and refrigerate until ready to serve. 2. Prepare Spring Rolls: In pie plate or round cake pan, add warm water. Working with 1 wrapper at a time, soak wrapper in warm water 2 to 3 minutes or until flexible and transparent. Place wrapper on work surface. Arrange 3 cilantro leaves and 2 mint leaves on bottom half of wrapper, leaving 1-inch border around edge of wrapper. Top with some avocado, then green onion, bell pepper, cucumber, carrot and 4 shrimp. Fold sides of wrapper over filling, then roll tightly to enclose filling completely, being careful not to tear wrapper. Repeat with remaining wrappers and fillings. 3. To serve, sprinkle nut topping over dipping sauce. 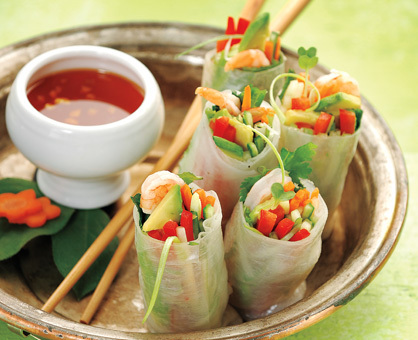 Cut spring rolls in half; serve with dipping sauce. > Wrap prepared spring rolls in plastic wrap and refrigerate up to 2 days. > Try serving with plum sauce in addition to the Chili Dipping Sauce. > Though high in fat, avocados offer both monounsaturated and polyunsaturated fats which support a heart-healthy diet.